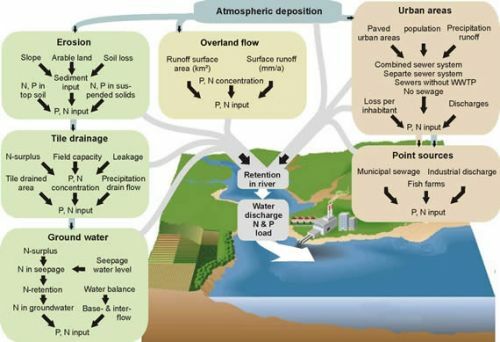 MONERIS (MOdelling Nutrient Emissions in RIver Systems) is a semi-empirical, conceptual model for the quantification of nutrient emissions from point and diffuse sources in river catchments (Behrendt et al., 2000; 2002a; 2002b). MONERIS now has a new model surface programmed in C#, which we implemented in 2012, (previously EXCEL/VBA was used for all calculations). In MONERIS results are presented for total nitrogen (TN), total phosphorus (TP) and dissolved silicium (Si). Furthermore, a scenario manager has been developed to calculate the effects of measures on the nutrient emissions for different pathways and spatial units. The model is based on data for runoff and water quality for the study area, along with a Geographical Information System (GIS), thus bringing together digital maps as well as statistical information for different administrative levels. The application of MONERIS allows regionally differentiated quantification of nutrient emissions into a river system on the level of an analytical unit. The results can be visualised in GIS generated maps.